A manometer is a device used for gauging pressure exerted in a fluid column. The device is a typically U-shaped, cylindrical and handy in a way that is easily portable. It has two arms with a liquid that rises when pressure acts upon it. The digital manometer is popular and is commonly used by technicians in the testing and measuring industries. These days, many companies have specialized in making different kinds of manometers: specifically analog and digital manometers which makes it hard for buyers to choose the best manometer to suit their needs. 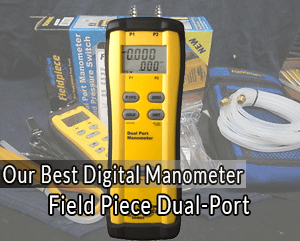 This guide will highlight the best digital manometers available on the market and explore important factors to consider when buying a digital manometer. 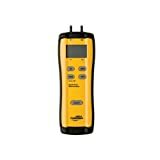 Field Piece Dual-Port Manometer (SDMN5) is a handy, sturdy dual-port device ideally designed for HVAC/R field professionals. The device is used to measure static pressure, differential pressure, and gas pressure. The SDMN5 features a zero adjust button on the face of the meter, a sturdy rubber boot, and a magnet at the rear, which helps in hanging the manometer during service. In addition, it has the Auto-Off function that helps in conserving battery life. The manometer measures pressure ranging from -60inWC to 60inWC and -150.0 to 150.0 mBar. It also measures pressure at two points (point 1 and point 2) and then calculates the pressure difference between the two points. You can also use the resolution mode of either 0.01mBar or 0.01inWC to take static pressure measurements. The manometer comes with an adapter, usually measuring between 3/16 inches to 5/16 inches, as an add-on. The adapter is used to measure inlet and outlet gas pressures. 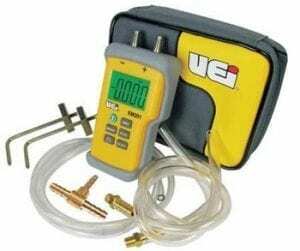 UEi Test Instruments EM152 is a Dual digital manometer with a differential measurement of up to 80.27inWC (inches of water column) range. It is a newly designed device belonging to the EM family fitted with intuitive interfaces perfect for testing pressure. The manometer features a zero adjust button on the face of the meter, and a magnet mount at the rear, which helps in hanging the manometer during service. In addition, it has the Auto-ranging and a data-holding feature that helps in determining the ideal data to hold in different ranges of pressure. It comes with a flexible, fine, transparent, silicone tubing, 2-barbed gas valve fitting, a soft pouch a manual and lithium battery of 9V. All these inclusive components work hand in hand to make it easy when measuring. The manometer measures pressure in 11 scales; PSI, mBar, PSI, inh20, Oz in, kgcm, cmh2o, kpa, inhg, bar and mmhg. 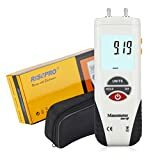 RISEPRO manometer features a smart Dual Input, which makes it easy to measure differential pressure of dual input probes. 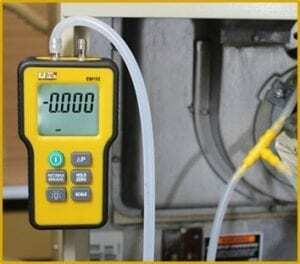 It measures pressure of ±2.000psi and with accuracy of ± 0.3% in full scale. The device measures maximum pressure of 10psi and may not show readings when the pressure is more than 10psi. 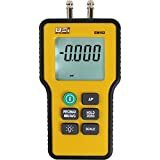 If you are looking for a digital manometer to use for pneumatic controls, gas appliances, medical purposes, laboratory testing, gas appliances installation, and repair or even HVAC industry then this is your device of choice. 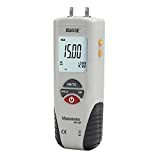 Rupse Hand – Held HT – 1890 Manometer is an indispensable tool for HVAC professionals designed ideally to check pressure of air conditioning systems, and ventilations. The device can also be used for corrective maintenance of gas pressure system. The manometer is made with a nice backlit LCD display system that offers clear reading when in use and makes the whole operation simple. Just like most manometers, this device is used to measure differential pressure and is scalable to 11 units; kgcm², ftH2O, inH2O, bar, psi, kpa, inHg, mmHg, mbar, ozin², cmH2O. The device can be used to test pressure in gas appliances installation and repair, pneumatic controls, HVAC, medical equipment, computer peripherals, and laboratory testing. The manometer comes in a package with 2 soft plastic tubes, 2 hard plastic hoses, a pressure connector, a cloth bag, a 9V battery and a user manual. These accessories work together to create an easy installation process that is easy to use. The Perfect Prime AR1890 is a manometer designed to gauge pressure and measure differential pressure ranging from ±55.4 H2O/±2psi/±13.79. It measures pressure with the 11 selectable units and scales: pkgcm², ftH2O, inH2O, bar, psi, kpa, inHg, mmHg, mbar, ozin²,cmH2O. The device has a high recording accuracy of ±0.3% FSO in full scale. It has a maximum pressure rating at 10psi and will show error message code (Err1) when the rate is exceeded. The under range indicator will show ‘Err2’ code message on the screen. It comes with 2 pairs of tubing, a barb access fitting, a soft pouch, and an instruction manual. The accessories are essential during installation and every time you operate the device. The manometer has a large LCD backlight that makes it easy to read and operate it. Additionally, the device has zero adjust and offset functions and auto power with each playing an important role. The zero adjusts helps you reset your manometer. The offset helps you determine the balance while an auto off will switch the manometer off. Before you go to the market, always consider what you will use your manometer for. This will help determine the ideal one that will serve your needs. 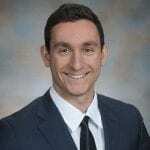 Outlined below are other important factors you will need to consider before finally buying a digital manometer though. Most digital manometers are constructed in almost a similar ergonomic design. They have a dual port on the top, a magnet at the rear, an LCD display on the front with the zero buttons slightly below the display. They are usually small and light in weight and this design makes them easily portable. However, it is good to note that some features differ in terms of size. The size of the LCD display varies from one digital manometer to another. Some have a widescreen, which is advantageous because you will not have to worry about straining to read the digits that appear. Some are small but equally enough. Digital manometers have many features in common. They are handy and portable devices usually of small sizes and very light in weight. In fact, their weight can be measured in ounces. This makes them very easy to carry around. Common features of any digital manometer are; a display (mostly LCD) that shows the results, the 11-scale unit that measures weight in different forms, a magnet that helps to hang the meter and a zero adjust button that resets your device. Almost all digital manometers use the 9-Voltage lithium battery. All the 5 manometers listed in this guideline use the 9V Lithium battery. 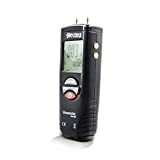 To be specific, the lithium battery is fitted with all the devices bar one manometer (Perfect Prime AR1890 Professional Digital Air Pressure Manometer) which requires you to purchase the battery separately. Performance refers to the accuracy and the number of tasks a manometer can execute. Different manometers have different accuracy levels and different tasks that they do when measuring pressure. In terms of tasks, most digital manometers are generally used in the most common area of application, which includes: in HVAC, pneumatic controls, gas appliances, medical purposes, laboratory testing, gas appliances installation and repair. The best digital manometers have a high performance. They will let you do your measuring job without having to worry about accuracy and the tasks they are capable of doing. User ability refers to the ease of use of a manometer. User-ability usually depends on the features that accompany the manometer. The features that are incorporated in the digital manometers make them easy to use. Almost all digital manometers have an LCD display that helps you to read your measurement clearly. The lightweight design of manometers makes it easy for you to carry, hence, easily portable. The 11-scale unit measures weight in different forms. The magnet helps to hang the meter and a zero-adjust button assists in resetting your device back to zero. However, there is a slight difference among the manometers in terms of size of display, weight and even the size of the manometers in general. Manometers with a relatively larger display are easy to use. They will let you read your results on the display without straining your eyes. Different kinds of digital manometers are available at the market at different price tags. The price range is brought about by the differences in quality, functionality and incorporated features. The features differ in accordance with the functions they execute. Quality always comes at a price. This is to say that, you are going to dig deep into your pockets if you want to buy a high-quality digital manometer. A quality manometer has a high performance, is highly accurate, and comes along with unique features that make it easy to use. Most digital manometers recently developed are of high quality though. The five picks are the highest rated in the industry but differ in prices due to functionality and additional features they come with. At the end of the day, all you have to get is an affordable manometer that will meet your demands without having to dig so deep in your pockets. The measurement of pressure is as old as time. The manometer, simple and precise, is one of the oldest ways to measure the pressure of gases and fluids. Getting the right gas or liquid pressure measurement is basically dependent on the kind manometer you will use. Hence, you need to choose a digital manometer with high accuracy and excellent LCD display. These types of manometers, will not only give you accurate pressure readings but will also offer a nice display that is easy to read the results. The most important thing to consider when buying a digital manometer is its performance and ease of use. The construction and design plus features and the accessories that come along with them do not largely differ. That said, you should get a digital manometer that meets your demands, has a considerable warranty and is affordable. Which of the 5 digital manometers on this list do you think is your favorite?